Several categories of risk of species extinction have been defined (Mace & Lande, 1991). A species can be described as vulnerable if there is considered to be a 10% probability of extinction within 100 years, endangered if the probability is 20% within 20 years or 10 generations, whichever is longer, and critically endangered if within 5 years or two generations the risk of extinction is at least 50% (Figure 7.17). Based on these criteria, how many species on earth? modern and historic extinction rates compared a human-induced mass extinction? 43% of vertebrate species have been classified as threatened (i.e. they fell into one of the above categories) (Mace, 1994). On the basis of these definitions, both governments and nongovernmental organizations have produced threatened species lists (the basis of analyses like that shown in Table 7.4). Clearly, these lists provide a starting point for setting priorities for developing plans to manage individual species. However, resources for conservation are limited and spending the most money on species with the highest extinction probabilities will be a false economy if a particular highly ranked species would require a huge recovery effort but with little chance of success (Possingham et al., 2002). As in all areas of applied ecology, conservation priorities have both ecological and economic dimensions. In desperate times, painful decisions have to be made about priorities. Wounded soldiers arriving at field hospitals in the First World War were subjected to a triage evaluation: priority 1 - those who were likely to survive but only with rapid intervention; priority 2 - those who were likely to survive without rapid intervention; priority 3 - those who were likely to die with or without intervention. Conservation managers are often faced with the same kind of choices and need to demonstrate some courage in giving up on hopeless cases, and prioritizing those species where something can be done. However, while some species are born rare, others have rarity thrust upon them. The actions of humans have undoubtedly reduced the abundance and range of many species (including naturally rare species). A review of the factors responsible for recorded vertebrate extinctions shows that habitat loss, overexploitation and invasions of exotic species are all of considerable significance, although habitat loss was less prominent in the case of reptiles and overexploitation less important in the case of fishes (Table 7.5). 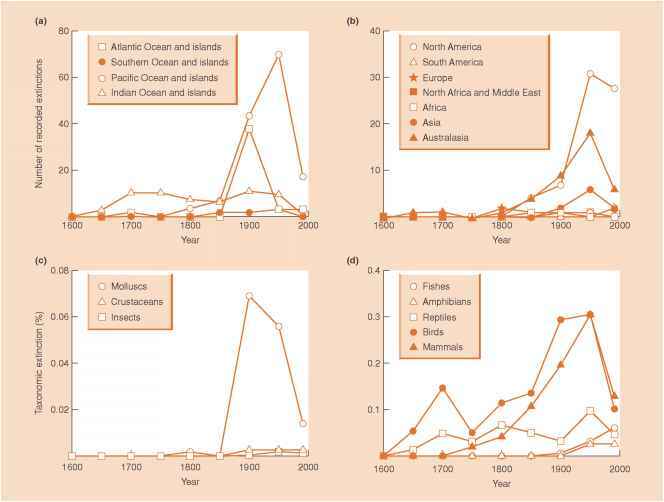 As far as threatened extinctions are concerned, habitat loss is most commonly the major hazard, whilst risk of overexploitation remains very high, especially for mammals and reptiles. The probability of extinction may be enhanced in small populations for two different reasons related to genetics (Section 7.5.3) and population dynamics (Section 7.5.4). We deal with them in turn. 0.0 0.2 0.4 0.6 0.8 1 Probability of extinction other species have rarity thrust upon them are rare (Fiedler, 1987). The rare species have larger bulbs but produce fewer fruits per plant and have a smaller probability of survival to reproductive age than the common species. The rare species can all be categorized as climax species that are restricted to unusual soil types, whilst the common one is a colonizer of disturbed habitats. 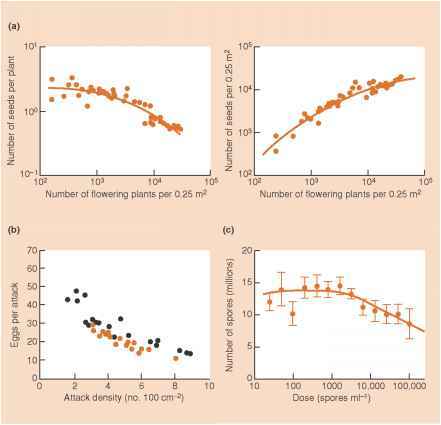 Rare taxa may generally have a tendency towards asexual reproduction, lower overall reproductive effort and poorer dispersal abilities (Kunin & Gaston, 1993). In the absence of human interference there is no reason to expect that the rarer types would be substantially more at risk of extinction.